Every year I watch the giant ragweed start to grow. It lines the road. It surrounds the barn. It fills the barn lot and adjacent pasture. Its population gains every year. The pollen spikes start growing. They get six to ten inches tall lined with green balls. When the green balls open, releasing pollen into the air, the boxes of tissues get set out around the house. By mid September the spikes are only brown stalks. The pollen is gone for the year. Now the seeds scatter across the ground promising a new, bigger crop of giant ragweed next year. Flower: There are separate male and female flowers. 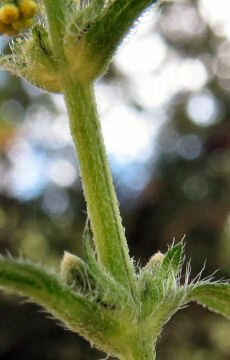 The male flowers are in hanging bundles on a spire. One main and several auxiliary spires can come from the tips of each branch. The female flowers are tucked into swirls of bracts at the base of the spires. The flowers are wind pollinated. 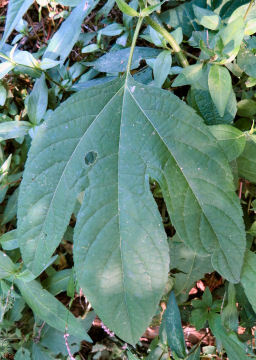 Leaf: Opposite leaves are rough, green on the upper side, slightly paler on the under side and covered with very short hairs. Many of the leaves have three lobes but can have five or none. Main veins run out each lobe. The leaves have long petioles that can be winged. each leaf can reach twelve inches long and eight inches wide. Stem: The thick, ridged stem can reach 12 feet in height. It has branches. The stems are light green, rough to the touch, stiff, hollow and have lines of short hairs. The bases of tall stems thicken, become woody and can be three inches in diameter. Root: The annual roots are fibrous around a taproot. Fruit: The seed is tan with an ovate base. the top has a main rounded spike surrounded by a ring of lower, rounded lobes. Habitat: This plant prefers full sun, good soil and moisture. It is not particular and grows in a wide variety of places especially disturbed ground and pastures. Edibility: Cattle, goats and deer eat giant ragweed. The seeds have a tough coat but can be eaten. Giant Ragweed is considered a noxious weed in some states. it does tend to form dense colonies once established in an area. It is the most abundant ragweed. The plants are annuals and produce lots of seeds. These germinate in mid to late spring. The seedlings grow rapidly often in dense stands, many of which die from the competition. 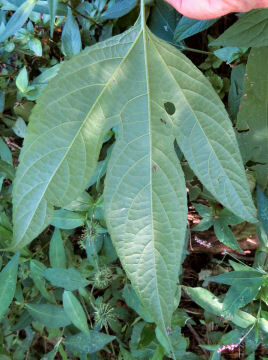 Although, under ideal conditions, Giant Ragweed can to 12 feet with stalks three inches in diameter, tough enough to require a saw to cut them, many times the plants are cut or grazed or mowed off. The plants then put out new branches quickly reaching two to three feet and blooming. Even six inch plants will put up single spires. As are other ragweeds, Giant Ragweed is wind pollinated. Each plant produces tremendous amounts of pollen. This is a major cause of hayfever in late summer. Bees still visit Giant Ragweed male flowers to gather pollen. They may knock some pollen down on the female flowers, but do not visit them. They leave the pollen spikes heavily laden. 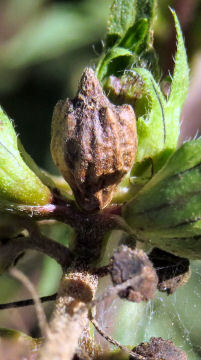 Archeologists find caches of Giant Ragweed seeds at various sites. The seeds are tough but do contain edible oils. Few birds can eat them due to the tough shells. This entry was posted in Ozark Hills and tagged ambrosia trifida, giant ragweed, hayfever, Ozarks, pollen, wildflowers on September 27, 2017 by [email protected].